The entire family of the farmer was so happy with the new car, that they decided to distribute pedha in the entire village. When folks are happy, they usually share their joy with friends and family. Suresh Pokale, is a happy man. The farmer from Dhayari village, just outside of Pune, will be remembered for his celebratory efforts. 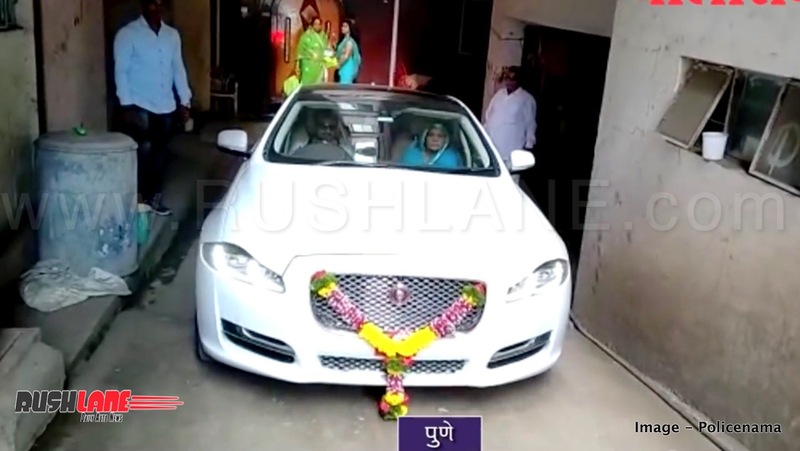 His latest wheels, a Jaguar XJ saloon, that set him back by Rs 1.34 crore. In celebration, as is common practice in certain households, he decided to distribute sweets. And sweets the were. Cause now we know what a gold leaf wrapped pedha looks like. The idea came to the family from a TV clip, and were instantly inspired. On the occasion of rakhi recently, a sister gave her brother a golden pedha on Rakhi. The Pokale family were drawn, and the family agreed this was a great idea. They decided to request Kaka Halwai to take care of their special order, and the sweet maker agreed. The pedhas cost Rs 7,000 per kilo, and the joyous family distributed three kilos. The sweetshop toiled three days to make and supply the special order. And they distributed these in the entire village. It took three days to make this delicacy.